As an Athletic Trainer, I highly recommend this stocking stuffer idea today: FootBalance QuickFit pre-molded footbeds. FootBalance QuickFit pre-molded footbeds can be customized to users’ unique feet in one of two ways—either the Wear Mold or Heat Mold methods. With the Wear Mold method, users place the pre-formed footbeds in their shoes, where a natural customization process will take place over time. The Heat Mold method allows users to customize the footbeds in their conventional oven at home, or in a FootBalance oven at participating retailers to quickly contour the QuickFit footbeds perfectly to their feet. By walking around for five minutes, the QuickFit Heat Mold footbeds take form while the patented Balance Plate core provides optimal posture and alignment. FootBalance QuickFit footbeds come in a narrow width model for narrow to normal width shoes and a standard width model that fits normal to wider shoes. They also feature a universal mid-to-high arch height that will mold to arches of all shapes and sizes. FootBalance QuickFit pre-molded footbeds complement the brand’s current line of 100% custom molded footbeds. The fully custom option is rapidly molded in fewer than 10 minutes by trained FootBalance dealers using the FootBalance Recommendation System (FRS) software to provide a free overview of users’ unique foot dynamics and stance. The FootBalance team includes medical specialists, sports professionals and footwear designers working to create footwear products to enhance the health, comfort and performance of its users, for a wide range of activities. Footbalance is an innovative insole that brings you the benefits of custom orthotics at an affordable price. With Footbalance you get a complete foot analysis and custom molded insoles in under 10 minutes. Each insole is individually custom molded for each foot, to ensure perfect fit and support no matter your arch type, foot shape or differences between the left and right foot. Your insoles are available for trial and use immediately - at a price that won't break the bank. 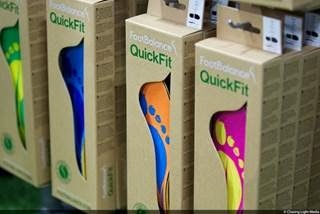 Buy It: You can purchase all FootBalance QuickFit Footbeds from Road Runner Sports and Foot Smart.